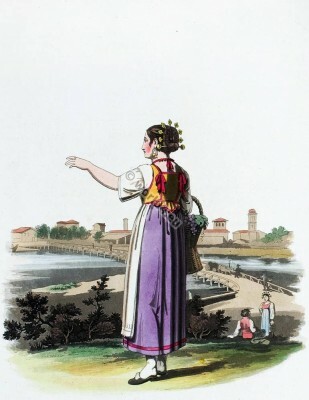 Home » Traditional costume near Lodi, Italy 1821. THE fine dark hair of a southern climate is shown to the greatest advantage by the white metal pins which form a kind of shell above the whole, without disfiguring the shape of the head. In the distance is seen the bridge of Lodi illustrated by the victory of Buonaparte over the Austrians. The cheese called Parmesan has spread the name of Parma allover the world; it is however entirely the product of the Lodesan fields; the pasture, the cows, and the dairy-men are all in the Lodi territories; but the Parma merchants were the first to spread it amongst foreign nations, and robbed the rival city of it fair name. The head dresses of the females are as excellent in their kind as their cheese, and yet they are not known, while French tawdry and pomatum are carried to the ends of civilization. Source: “Sketches Illustrative of the Manners and Costumes of France, Switzerland and Italy.”Illustrations by Richard Bridgens. Text by J.W. Polidori London. Baldwin, Cradock & Joy. 1821.